Our season launch concert starts with Dvořák, introduces our season focus on Beethoven’s Op.18 string quartets, and features Britten’s third string quartet. Beethoven was profoundly deaf, which caused his increasing isolation from society. He is quoted as saying “I was compelled early to isolate myself, to live in loneliness”. We will be exploring four quartets over the project that demonstrate Beethoven’s mastery of the string quartet. Britten’s third string quartet was written in the last year of his life at a time when he was acutely aware of the approach of death. It is haunted by questions which are explored in his opera ‘Death in Venice’ - the artist’s lonely search for beauty. Book tickets online at our Online Box Office or directly from the City Halls box office. 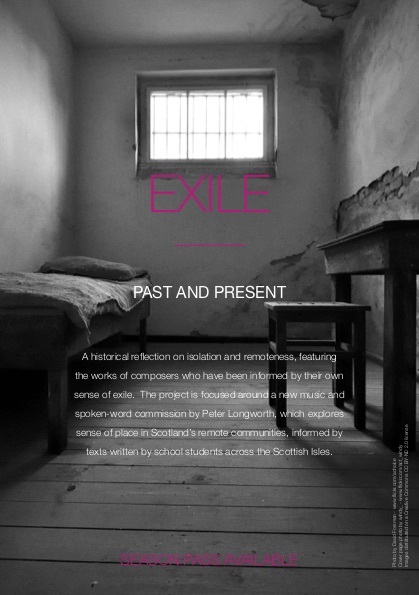 Season Pass offer: Book all four Glasgow 'Exile' concerts through our Online Box Office and save up to 20%. Select the season pass in the event list.